There are currently mandatory reporting obligations on registered health practitioners under the Health Practitioner Regulation National Law (National Law). The mandatory reporting obligations are designed to protect the public by ensuring that the Australian Health Practitioner Regulation Agency (AHPRA) and other regulatory agencies are aware of conduct that can place the public at risk and take any necessary action to address the risk. 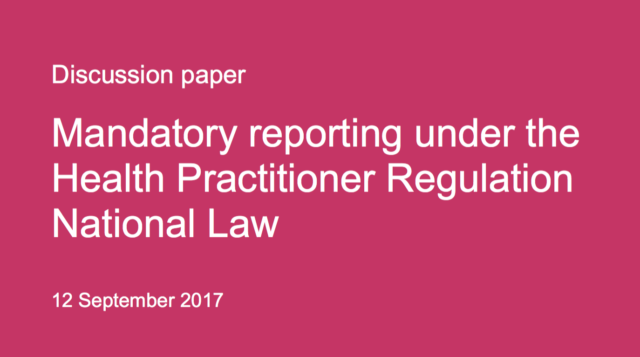 However, there are concerns that the current mandatory reporting requirements for treating practitioners under the National Law may be deterring practitioners from seeking assistance and treatment for their health conditions. At the COAG Health Council meeting on 4 August 2017, Health Ministers agreed that mandatory reporting needed to protect the public from harm and support practitioners to seek treatment, in particular mental health treatment, as soon as possible. Health Ministers also agreed that practitioners should be able to seek treatment for health issues confidentially whilst also preserving the requirement for patient safety. All Health Ministers supported a nationally consistent approach to mandatory reporting provisions. They have asked the Australian Health Ministers’ Advisory Council (AHMAC) to provide advice on a nationally consistent approach under the National Law, following the release of a Discussion Paper Mandatory Reporting Sep 2017 and consultation with consumers and practitioner groups. Submissions are sought by 29 September 2017.